This shortened talk was for the Fort Bend Chamber of Commerce back in April, 2016. Email me at robert@robertboudwin.com to schedule me to present at your next business function or other special event. 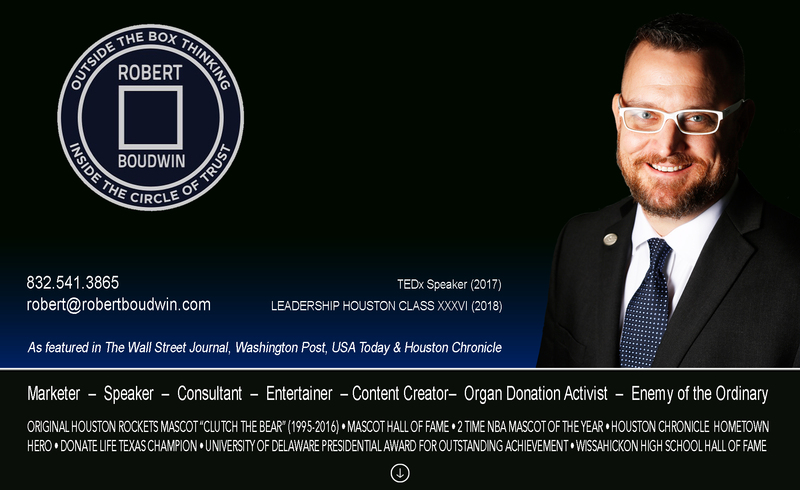 In the full presentation pulling from a 21 year journey as the NBA’s Houston Rockets Mascot Clutch the Bear you will hear; a little bit of a behind the scenes looks at the sports entertainment business, a little bit of sales and marketing, a little bit of building a brand from ground zero, a little bit of my family’s experience with the life saving effects of organ donation, a whole lot of perseverance and persistence along the road less traveled in spite of odds stacked against success, and ton of funny anecdotal true stories that will inspire, motivate, and entertain you all while making you laugh. I hope to hear from you soon! Next Next post: IT’S OFFICIAL!